Hi, my name is Andrew Weatherhead. I’m a Chicago native and a member of the Geographic Society of Chicago, though I’ve lived in New York City off and on since 2005. I currently call the Red Hook neighborhood of Brooklyn home, which — as you may or may not know — is a coastal enclave of some historic significance. It was part of the original 17th century Dutch settlement known as New Amsterdam, it played a role in The Battle of Brooklyn during the Revolutionary War, and from the 1920’s to the 1960’s it was the busiest freight port in the world. 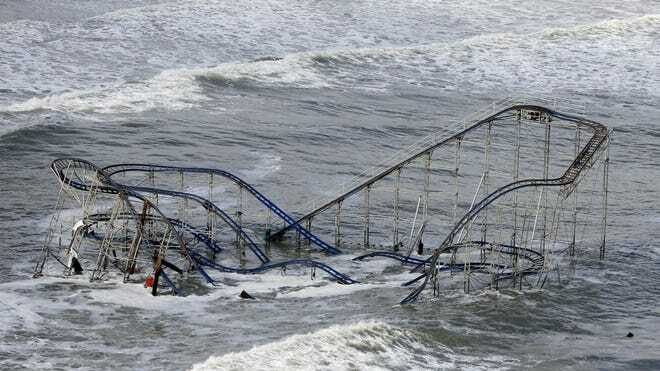 It was also one of the areas hardest hit by Hurricane Sandy on October 29th. Given my proximity to this extraordinary meteorological event, I thought I’d use the following blog post to give a personal account of my experience and try to answer some questions the storm has raised about the nature of extreme weather and the future of urban development in a changing global climate. 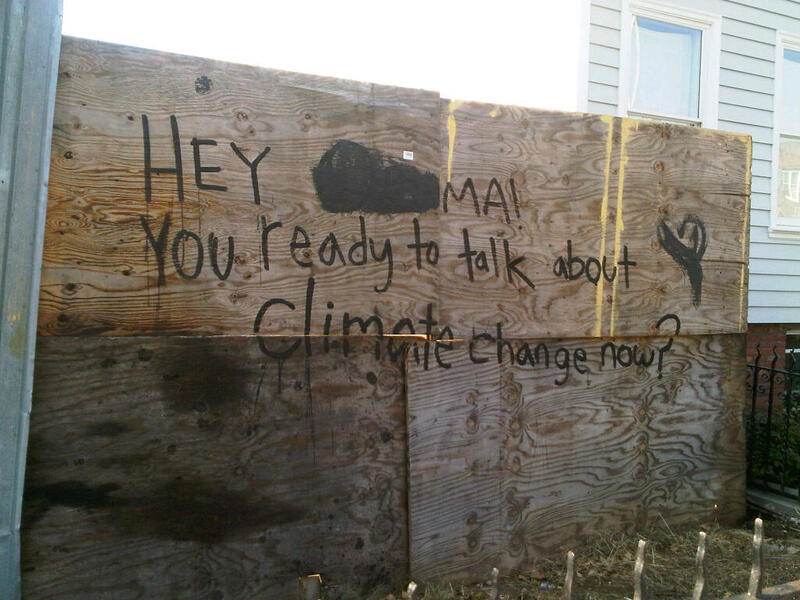 But Sandy didn’t arrive Sunday night as was forecasted. There were moderate wind gusts and heavy, foreboding cloud cover but nothing resembling the “superstorm” that had been predicted. I went to sleep that night wondering if I had wussed out by evacuating. Monday morning was more of the same — light rain and moderate wind, but no “frankenstorm.” A sense of restlessness seemed to settle over the neighborhood as plenty of people felt comfortable wandering around outside, waiting to see what, if anything, was going to happen. Most retail stores were closed and shuttered but bars, restaurants, and convenience-type stores were open and doing very well. 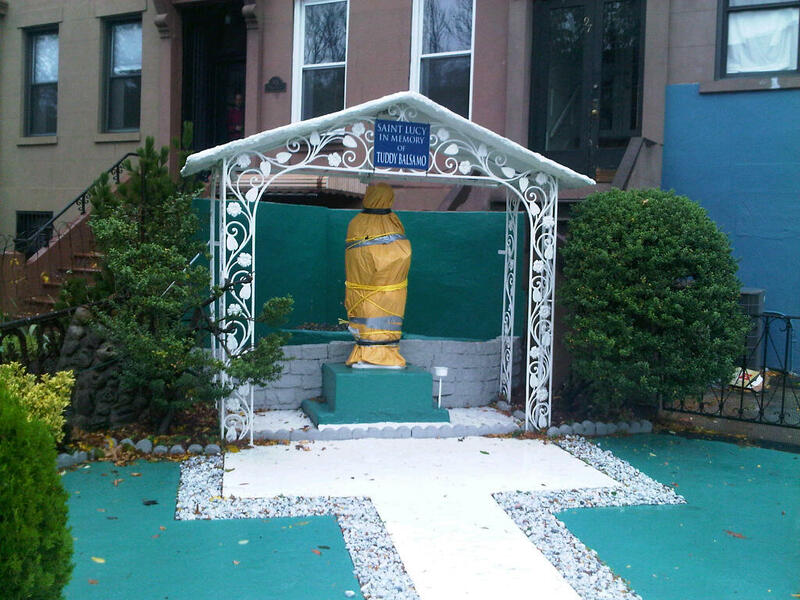 Saint Lucy, ready for Superstorm Sandy. I spent some of this downtime reminding myself how hurricanes are named. I can recall being a first-grader in 1992 when Hurricane Andrew hit Florida and feeling a little confused though oddly excited to see my name at the top of every news broadcast. I was too young then to understand the severity of that storm (which ended up being one of the most destructive in US history) though I did, and still do, find this tradition of humanizing severe weather a little curious. Apparently, the convention dates back to WWII when U.S. military meteorologists needed an easy way to distinguish between storm systems in the Pacific. 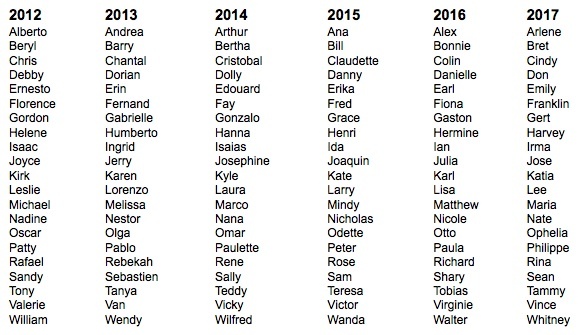 They chose women’s names in honor of their wives and girlfriends back home. In 1953, this method was adopted by the National Weather Service (NWS), replacing a cumbersome method involving a storm’s coordinates of origin. Since this was the first hurricane tracking and naming system of its kind, it became the standard. I can’t wait for Tropical Storm Mindy. 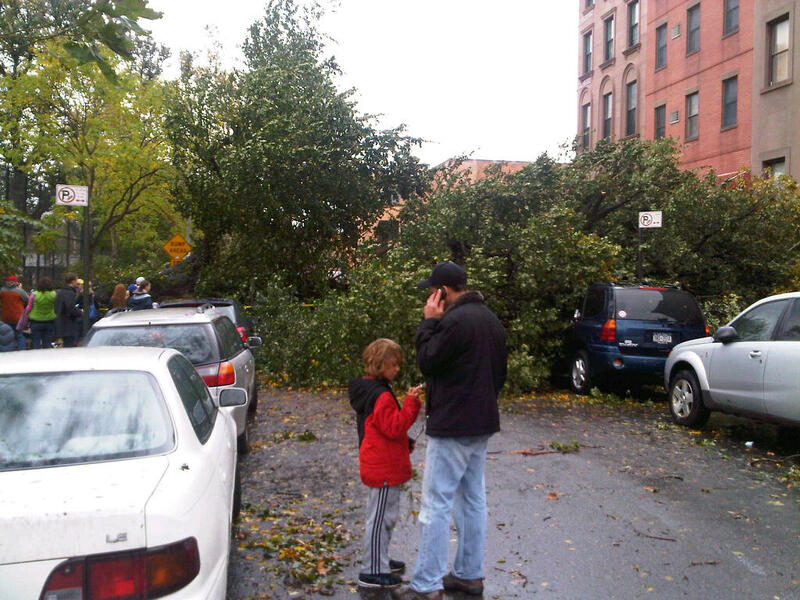 Then, Monday afternoon, Sandy hit. First it was the crane on 57th street, which dangled on the news for several hours. Gale force winds felled trees and other free standing objects. Then the flood waters arrived with high tide, around 8pm Monday night. That’s when things got a little scary. Something on the Hudson River exploded. Lower Manhattan lost power. The backup generators at NYU’s Langone Medical Center, where a friend of mine works, failed and all the patients had to be evacuated. Apocalyptic images of flooded subways and transit tunnels began to proliferate on the news and social media. I watched this unfold from a living room with no external facing windows in an apartment well above the floodplain — in relative safety. I scoured the news for any report from Red Hook, thinking of my roommates, but found nothing. One thing I couldn’t quite rationalize while these images continued to pour in was the source of all this water. It couldn’t possibly have been the rain, which was minimal — was the storm exerting some sort of pressure difference over the Atlantic, bringing this enormous mass of seawater with it? Or was it possible that surface wind alone could be responsible for this much flooding? Well, “yes” to the latter, and “not really” to the former. 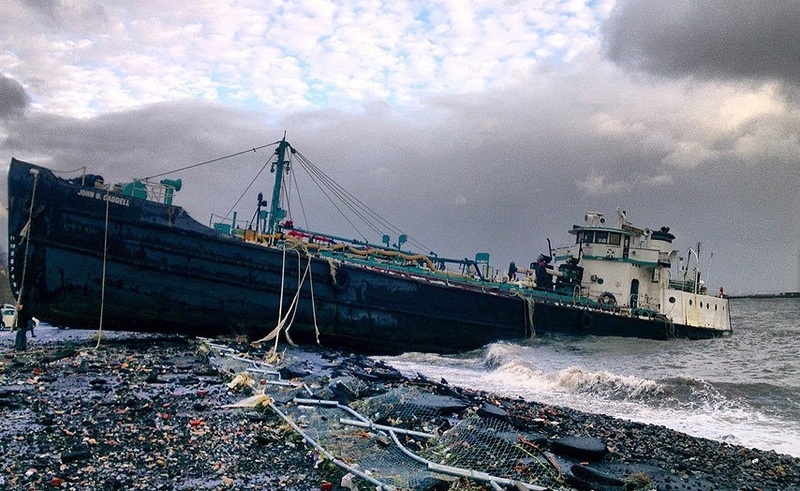 The flooding occurred as a result of Sandy’s “storm surge,” a swell of water generated by the cumulative effect of high-speed surface winds and the storm’s prevailing direction. When this swell reaches the shallowing waters of a continental shelf, it has nowhere to go but farther inland. The funnel-shaped geography of the New York Bight essentially ushered water inland towards Staten Island, coastal Brooklyn, and the tip of Manhattan. 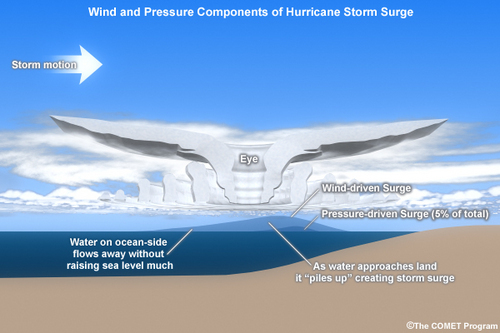 What made Sandy’s storm surge particularly disastrous was its almost exact coincidence with high tide, around 8:30 Monday night. The surge level, above the expected tide, was recorded at 13.88 ft, shattering the previous New York City storm surge record of 10.02 ft set during Hurricane Donna of 1960. When I woke up on Tuesday morning, it was overcast and raining lightly but the worst of the storm was over. The whole neighborhood was out assessing the damage — it almost felt like a street fair the way people congregated around the more spectacular sights. As my friends and I passed Carroll Park, a few blocks from their apartment, we saw two huge trees, both well over a hundred years old, completely uprooted. One fell across a street, crushing at least one car and destroying several sections of fencing. Emergency crews did their best to rope off the area but I think curiosity won out. 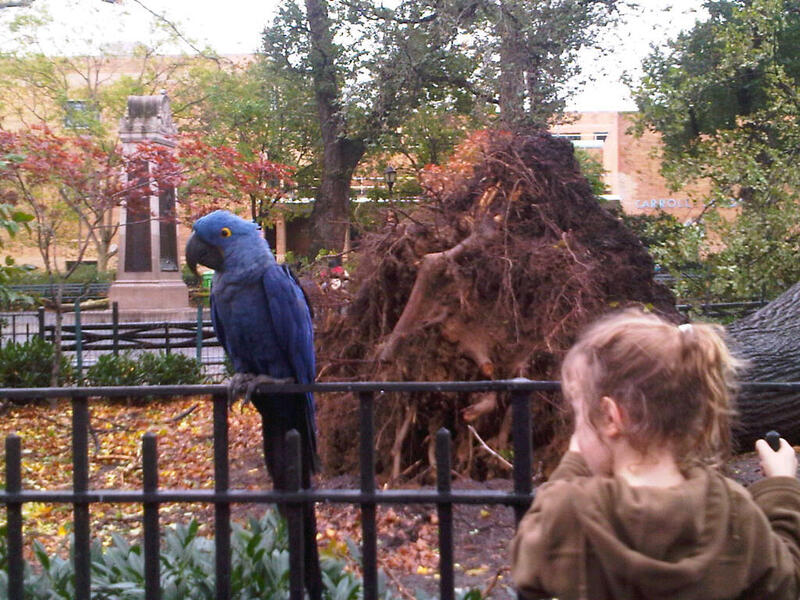 And as we crossed to the other side of the park, I saw one of the most indelible images of my Hurricane Sandy experience — a man had brought an enormous blue Macaw to the park and was showing it off in front of the other uprooted tree. There was a small crowd around him and the bird, children were invited to pet it, but it was so flagrantly ostentatious that it almost felt disrespectful in light of the city-wide destruction that had just bore down on us. Even the kids seemed to intuit how awkward the display was, many of whom seemed more afraid of the man and the bird than the man would have liked. I stopped to take a picture and kept moving. The Macaw seemed freaked out too. We were headed to my friends’ art studio located in a warehouse on the banks of the Gowanus Canal, an area at high risk of flooding. They had prepared the studio on Sunday, before the storm hit, getting as much art off the floor as they could and moving some tools and other supplies onto an elevated landing area. Had the flooding been around ankle, or even knee-high, the damage would have been minimal, but what we found was a wreck. Close to six feet of water had found its way into the studio, churned around, and destroyed anything left out on the warehouse floor. 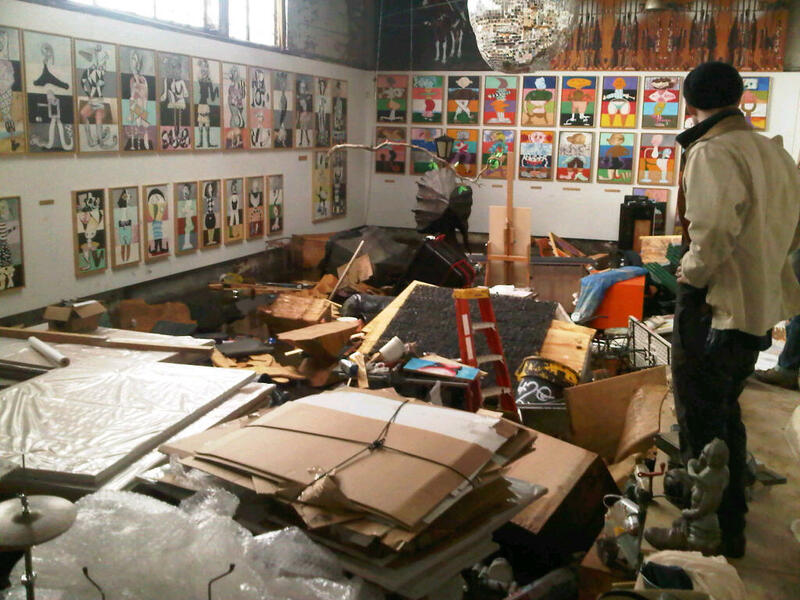 Note the far wall where the water level was high enough to lift canvases off their mounts. During this time I got a text from my roommate informing me our building lost heat, power, and hot water. He said he watched from our living room as the storm surge turned our street into a veritable river, completely inundating any cars left out and carrying a nearby deli’s ice box several blocks like it was a bath toy. Our garage was submerged and with it our boiler and electric meter, meaning both would have to be replaced before utilities could be restored. I was fortunate to have suffered little personal property damage (my bike was in the garage, it would end up being ok), but the loss of utilities thrust me, like so many others, into a state of utter helplessness. Standing ankle-deep in poop water, with the realization it could be weeks before I would be sleeping in my own bed, Sandy’s destructive prowess began to set in: it wasn’t just a hurricane to be survived, but to be endured. 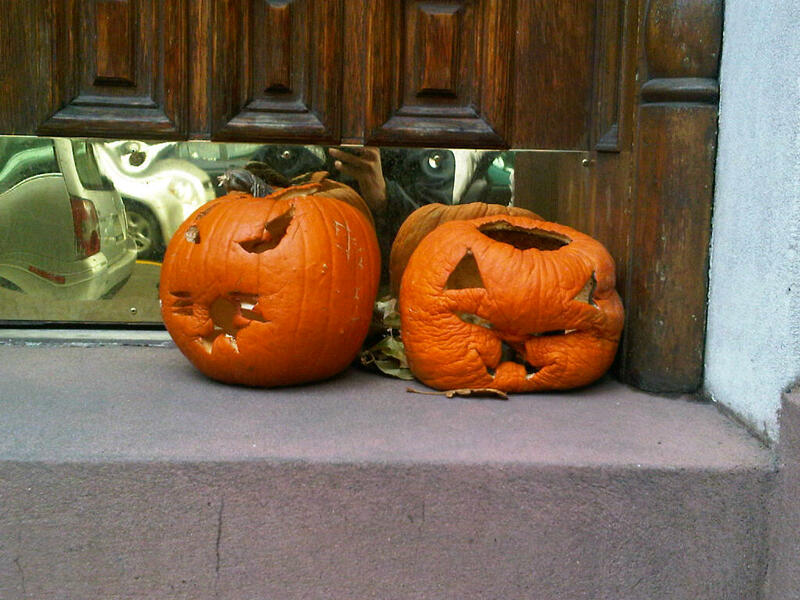 The following day, Wednesday, was Halloween but you would’ve barely known it. News from other parts of the city began to trickle in and the breadth of the storm made itself apparent. 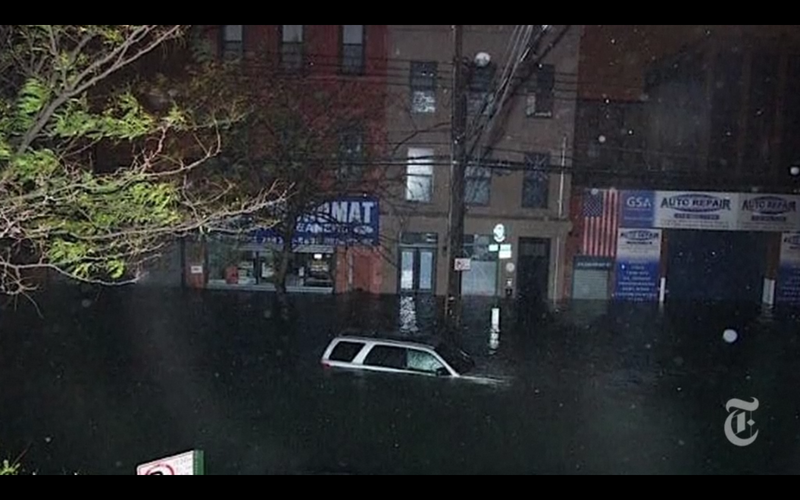 The images coming out of New Jersey, Staten Island, and the Rockaways were unreal. Public transportation, the lifeblood of the city, was in shambles. 7 of the 13 subway tunnels running under the East River flooded and had to be pumped out, a process that is still taking place a month later. 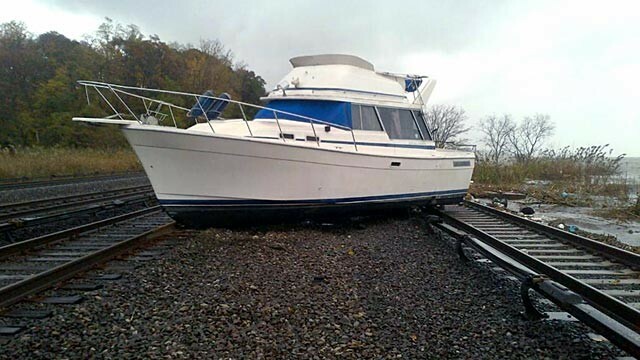 Above-ground commuter trains were likewise crippled by downed power lines and fallen debris, including a boat that washed up onto one of the Metro-North lines. Schools were cancelled through the end of the week, with the understanding that further cancellations were possible and likely inevitable in the cases of schools that were physically damaged or being used as shelters. Although this unequivocal connection between global warming and Atlantic Basin hurricane frequency/severity seems to gloss over much of the scientific method (which has yet to definitively prove such a correlation), there is no doubt the city needs to better figure out how to protect itself against flooding. The most apparent solution — and one that worked quite well in Stamford, CT — would be to build some sort of hurricane barrier or flood gate system in the New York Bay. This solution is also the most problematic. 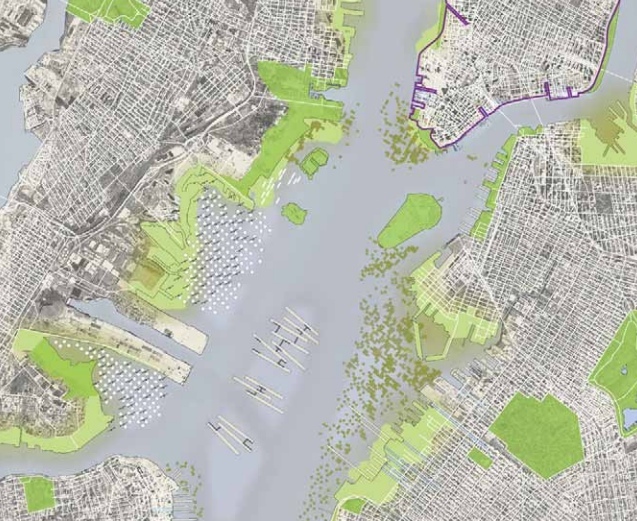 Depending on the placement, flood gates could cost between $6-15 billion to build, around $100 million more per year to operate, bottleneck shipping routes, and have vast untold effects on the bay’s ecosystem. Flood gates would also have the unfortunate side effect of increasing storm surge levels in the areas immediately adjacent to them, areas that would likely include the Rockaways and either Staten Island or the Jersey Shore, some of the areas most devastated by Sandy. Less drastic proposals call for a system of “soft edges” to be installed around the city’s existing profile. Some of these enhancements would include modifications like re-engineered coastline and beefed up sand dunes and sea walls — retooling that carries a fraction of the price tag (and reliability) of a hurricane barrier. More ambitious concepts involve an archipelago of man-made islands in the bay with, possibly, an oyster farming operation (“nature’s wave attenuators”) to curb future storm swells. Regardless of what is done to protect the coastline from future storms, there are certainly myriad ways the city can be better prepared for storm surge flooding. Much of this involves hardening infrastructure. The Metropolitan Transit Authority has already begun reinforcing subway entrances in low-lying areas. Giant inflatable plugs could potentially be used in the not-too-distant future to seal off tunnels in the event of rising waters. Con Ed has admitted, both before and after Sandy’s arrival, that there are numerous ways in which the electric grid could be more flood resistant — from “submersible switches” and emerging smart grid technologies to simply moving critical equipment to higher ground. Additionally, building code alterations already in the works will require coastal buildings to elevate their electric meters and hot water boilers, a simple constraint that would have saved my apartment from weeks of uninhabitability. Finally, there may be the unpopular decision to cede the shoreline to mother nature — a decision that would be made relatively easy should the government revise or scrap its highly problematic flood insurance program, making flood-prone living economically unfeasible. A sign in Red Hook. On Friday, the end of the week Sandy began, a friend and I decided to walk into blacked-out lower Manhattan, which we were referring to as “dark town.” Crossing the Brooklyn Bridge around 9pm, the view was incredible. Buildings weren’t just dark, they looked like the antithesis of buildings — the idea of a city gone wrong. Very spooky. I wish I had a photograph to illustrate how weird everything looked but a photograph would require light to give the darkness a perspective and there just wasn’t any light. We walked through an alien Greenwich Village, unable to recognize places we’d passed by hundreds of times, and met up with a friend who was still living out of his dark town apartment. We spent the rest of the night drinking whiskey by candlelight. He told us how he had gotten used to living without power, how he’d even come to appreciate and enjoy it. His power returned the next day. Mine would be three more weeks. Where Did Your Thanksgiving Dinner Come From? Calling all young cartographers!